Firstly, as you can see at the picture below, after downloading gdapi.jar file from our page, it is supposed to be placed into "libs" folder under your project. Copy gdapi.jar file and paste it into "libs" folder. 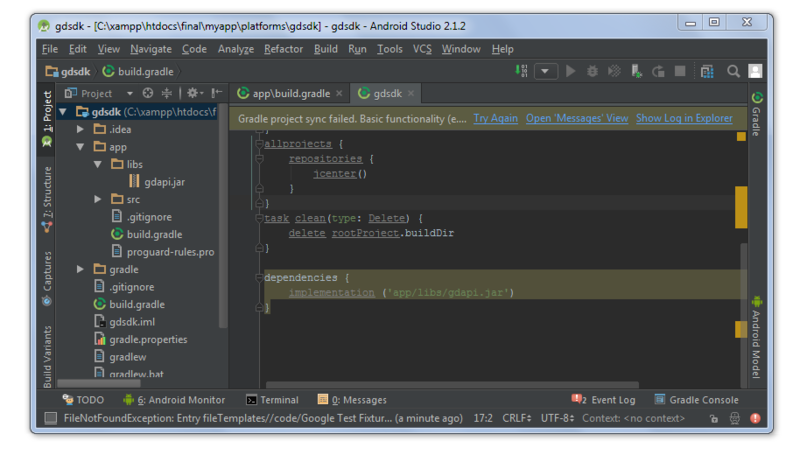 Secondly and finally, the library is supposed to be included and compiled at "build.gradle". There are three parameters required to invoke init function: Game Id, User Id and Activity Context which is required to show the ad in. There are two types ads which the developer can request for: Interstitial and banner ads. Interstitial ads are full screen ads that cover the interface of their host application. They're typically displayed at natural transition points in the flow of an application, such as between activities or during the pause between levels in a game. Banner ads are rectangular graphic display that stretches across bottom of a website. 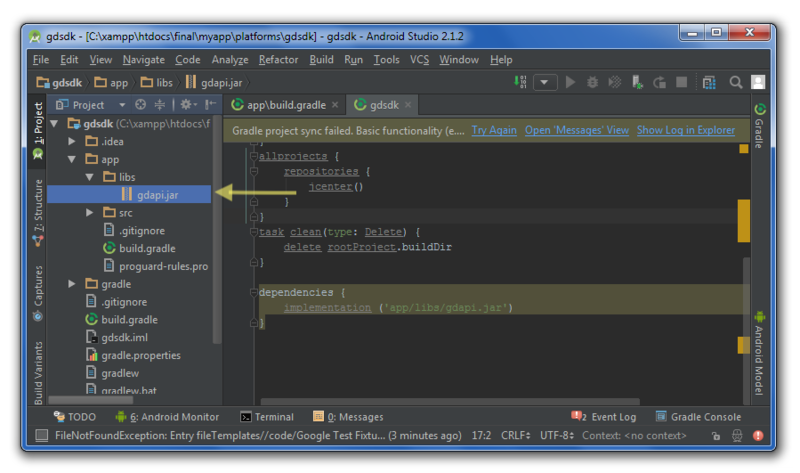 The picture below demonstrates how to request for banner and interstitial ads using GDApi. It uses ShowBanner() function to request and the function gets parameter as a json string. // It is possible to specify size, alignment and position of the banner ad. ShowBanner() can not be invoked for one ad type consecutively. Time limitation can be set on the user's account. For instance; you can not invoke ShowBanner for banner again within time limit if it has been already used for a banner request. However, you can request for an interstitial. If pre-roll is enabled, init function also requests for an interstitial. onBannerReceived: This event is fired when an ad is received. Also "adType" of data contains the type of ads loaded. onBannerStarted: This event is fired when an ad starts to show up. onBannerClosed: This event is fired when an ad is closed. onBannerFailed: This event is fired when an ad is failed to load. Also, "message" of data contains why. onAPIReady: This event means the api is ready to serve ads. You can invoke "showBanner". onAPINotReady: When something goes wrong with the api, this event is invoked. Api is supposed to be init again. onPreloadFailed: This event is fired when preloaded ad is failed to show. Also, "message" of data contains why. onPreloadedAdCompleted: This event is fired when preloaded ad is closed. onAdPreloaded: This event is fired when preload ad is received.